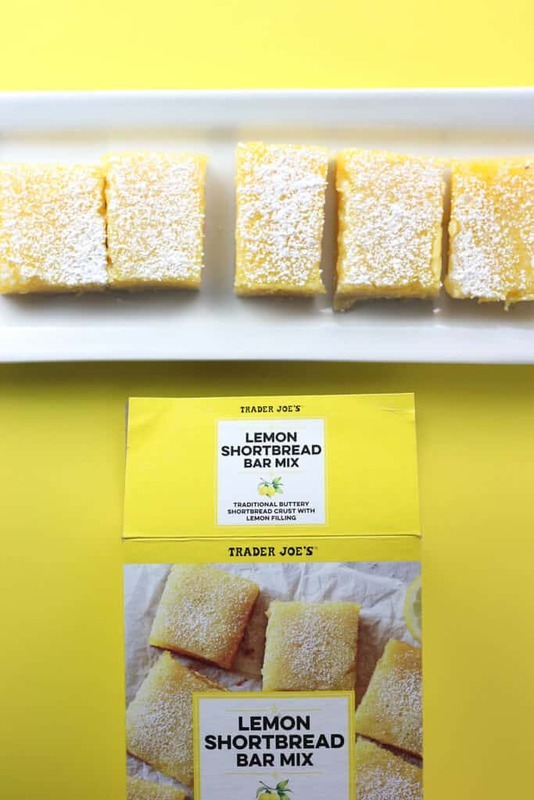 The pros: Trader Joe’s Lemon Shortbread Bar Mix makes for a pleasant and lemony dessert which has a nice contrast between the shortbread cookie and the soft lemony filling. The cons: Seriously, I don’t understand why Trader Joe’s hasn’t rolled out a no bake bar for the summer months. The thought of turning on the oven isn’t that appealing during the summer months. There were a few things unclear in the directions. I love citrus flavors. In the summertime, I like them best in drinks. I like them in baked good too. But I like them least in baked goods that I require me to turn on my oven. But this product hit the shelves, it went right into my cart and yes, my oven ended up being turned on in August. So my first complaint is as follows: there should a no bake bar for the summer months. No excuses. Now, whenever I have picked up something that requires prep work I need to know if the directions are correct. And the directions need a little bit of work and revision. The first step is assembling the shortbread. Butter and crust mix. My butter was room temperature. That’s what I define as softened. Had it been melted there would have been a chance it would form into a dough. If it is just softened it looks like a pie crust before the addition of ice water. It won’t be a dough until that bit of hydration comes in. So I pressed it into my pan in all of its powdery glory. And docking it, or the pricking of a fork on such a flaky item didn’t work. So I went forward anyways. At this point, those were the only flaws I found. Otherwise, what came out of the oven after adding the sugary lemon egg mixture was quite pleasant and delicious. I wouldn’t recommend using anything other than fresh lemons. I don’t own an 8 x 8 inch square pan. But simple math says the area of a 9 inch round pan is pretty darn close in size. Yes, middle school math came in handy on this one if you find yourself in the same situation. But what finally came out of the oven was a treat that was full of lemon flavor. It was sweet and slightly tart. 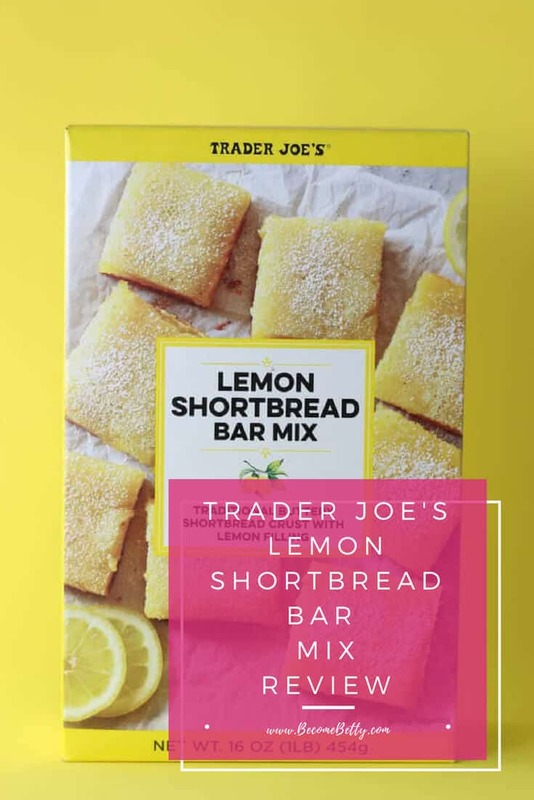 The shortbread cookie holds the lemon filling well. If you add powdered sugar, then do so before serving as anything I added the night before had vanished in the magical way that powdered sugar always seems to. For $2.99 it’s not a bad mix to pick up and use when turning on your oven sounds like a good idea. My husband liked these and I did too. Would I buy this again? 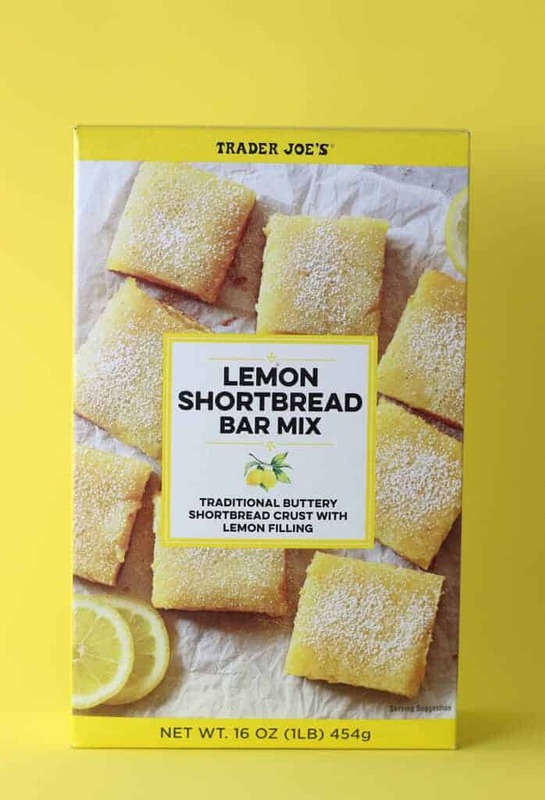 Trader Joe’s Lemon Shortbread Bar Mix was worth a try, but with pumpkin season around the corner I’m not sure I’ll be buying this again. Honestly, the Maple Pecan Bar was my favorite and I hope it will be back. I think those would be nice for a tea party. I think a Smores bar should be good. No brainer. Hey Alek! Yup, even a simple get together they would be a very presentable item to bring. They tasted pretty good too. Thanks so much for stopping by! 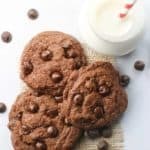 Couldn’t you have used your air fryer to make them? My air fryer bakes just as well as it fries. There is no way I would turn my oven on for anything (it is 92 @6:45pm where I am in Seattle right now) so I’ve been baking and cooking everything in my air fryer. 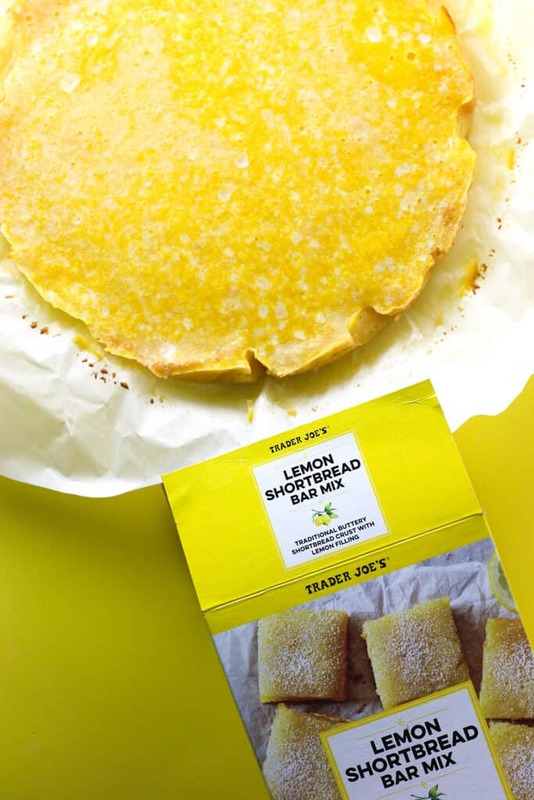 You would just probably need to make the lemon squares in a small round pan or even use foil and fashion a round pan out of that and make it lemon bar slices LOL. I’m already looking forward to Pumpkin season. Hey Dag! I am so sorry to hear how hot its been for you guys! It’s 90 here at 7:30, but in New York thats completely normal for August. You probably could air fry it, but you’ll have to play around with dimensions since this item gets baked twice. My air fryer couldn’t handle any of my bakeware as the basket is big enough to hold 2 empanadas at a time. What baked goods have you put in there? I’ve only done the savory stuff. Thanks so much as always for stopping by and sharing! 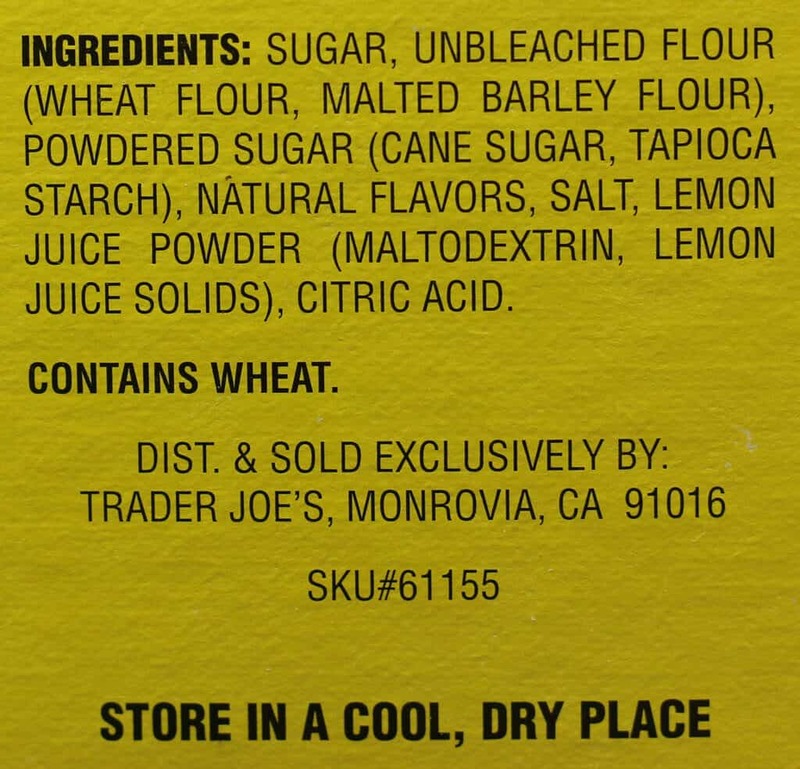 I feel like for a mix it requires a lot of additional ingredients…! And did it really make 16 servings? Maybe they’re just extra tiny portions. I swear i saw frozen lemon bars that sound almost exactly like this actually over by ice creams and such. Hey Ttrockwood! It’s three things: butter, eggs, lemon juice. Still beats making this from scratch. I have the lemon bars in my freezer. I haven’t gotten around to trying them yet. It’s on my list. Thanks so much for stopping by and sharing! 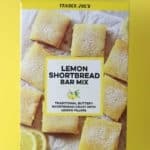 Ttrockwood—–Yup, I have seen said lemon bars in the frozen section also. They seem remarkably similar. Hey Dag! They’re in my freezer as we speak and I’ll eventually get to reviewing them. Makes me wonder why they would offer two items that are so similar. Thanks so much for sharing! Maybe this offering gives a opportunity to tweak up by adding swirls of raspberry jam. Or even blueberries! 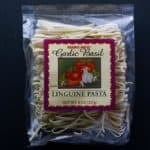 It nice to offer a mix so cooks can get creative. Break the tradition. Although the frozen ones are nice to have in handy. Hey Alek! Absolutely! Once you make something once you can add and play around with it to see how much it would need. Both of those would make for nice complimentary flavors. Thanks as always for sharing! Hey Dag! Yes, it’s small, but I like my air fryer. What did you think of the pretzels? I figure you would have a more authentic voice on this one as they are made in Germany :). Glad things are finally cooling off by you! I love the pretzels. Far superior to the generic Super Pretzel variety. 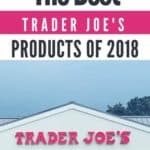 Trader Joe’s soft pretzels from Germany taste more authentic. Not as good as homemade but not much is. Topped with cheese, dipped in Pub cheese, dipped in different varieties of good mustard and gourmet mustard dips ( my grocery store has a clearance section and I found Stonewall Kitchens Blue Cheese Herb Mustard & Stonewall Kitchens Horseradish Bacon Mustard Dip for 50% off! )……I have done it all……lol! 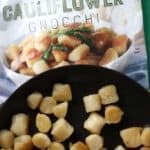 My husband and I tried these. 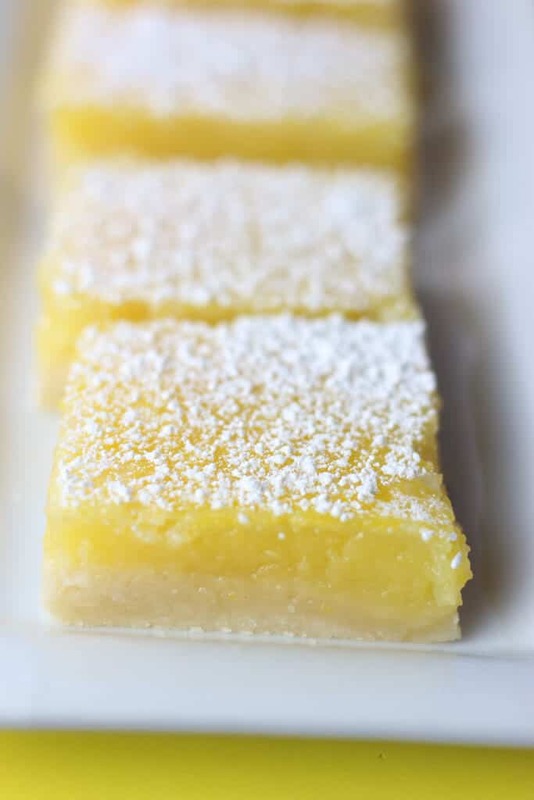 They were easy to make, but there is no comparison to lemon bars from scratch!! I’m enjoying your posts! I love TJs! 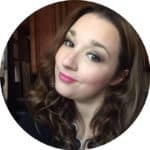 Hey Causeforthequiet! 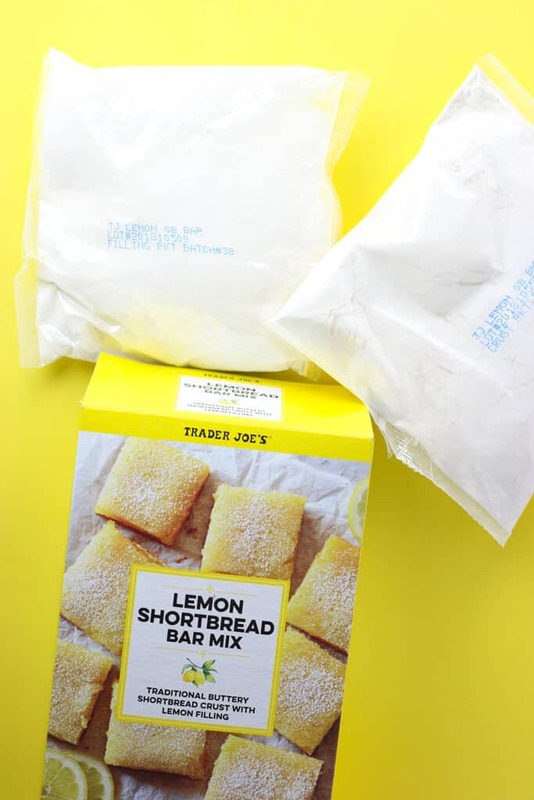 By chance, do you have a yummy homemade recipe you’d like to share with everyone? Just asking. Thanks so much for taking the time to stop by!